In the news yesterday was a story about a bell still in active use in Austria that was dedicated to Adolf Hitler. A rare find today, such things were common during the Third Reich, when towns all through Germany and Austria sent requests in to Hitler’s private chancellery for him to lend his name to a bell, a street, or a building. The man who screened these requests, and others, before passing them on to Hitler was a young, ambitious SS Reichsleiter named Philipp Bouhler. Bouhler had been part of the Nazi movement since his early twenties. Physically limited because of a wound suffered during World War I, Bouhler functioned primarily as a bureaucrat and propagandist (read samples of his later propaganda work for the party here and here). He handled the party’s finances and kept himself close to Hitler once Hitler was released from prison and assumed the title of Fuehrer. When the Nazis assumed power, Bouhler became a member of the Reichstag for Westphalia, but he continued to search for new and more important titles. 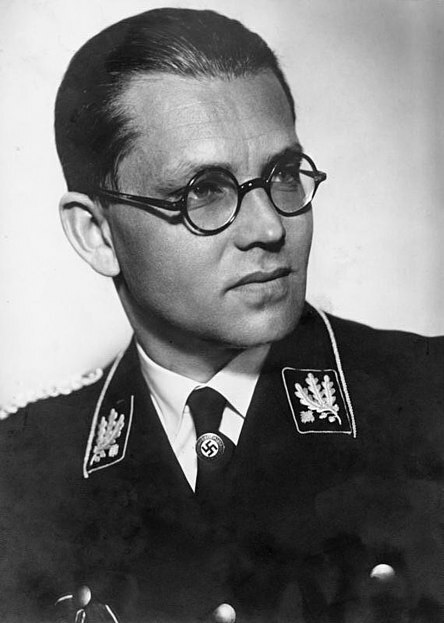 In 1934, he was named Chief of the Munich police, though shortly thereafter he traded up to a nicer title and a Berlin office when he was named the Chief of the Chancellery of the Fuehrer of the NSDAP. Now it should be pointed out that the Hitler state contained three main offices that could all lay claim to being the office of Hitler’s chancellery. They were the Party Chancellery, controlled by Martin Bormann; the Reichs Chancellery, controlled by Hans Lammers; and Bouhler’s Fuehrer Chancellery. All of them did more or less the same job. Inefficient? Sure. But this had long been Hitler’s practice. He detested arbitrating among competing party members, preferring to allow them to fight amongst themselves to determine who would take which responsibility. Hitler believed that by mirroring the laws of nature and allowing these struggles to play out, the best would win and the worst be rendered irrelevant. As a result, it was often a tricky thing, during the 1930s, to work out exactly which office had the power to grant an incoming request. Powers shifted and shuffled constantly. But everybody fought hard for each responsibility, because only by doing so could an ambitious Nazi gather the tools necessary to please Hitler. But how to work out what Hitler wanted? Well, to do that, one had to be close to the Fuehrer. It was a good idea to spend time at the Berghof, where Hitler spent much of his time socializing. What socializing meant on the Obersaltzberg was sitting in a room with Hitler while he delivered long, meandering lectures on…whatever happened to be on his mind that day. The subjects covered a narrow range: art, photography, opera, movies, architecture, the Jews, bolshevism, and the racial community. And Hitler never wanted a dialog. He liked to deliver his speech and be done. Hitler’s secretaries, servants, and companions were usually bored out of their minds after hearing Hitler deliver the same rant a few times– but the smarter ones listened carefully. Because while Hitler almost never laid out detailed policies, his harangues contained clues about how to gain his interest and approval. Smart bureaucrats, and Bouhler was certainly one, would use these clues to design policies that Hitler would find appealing. Bouhler took control of the office of censorship in 1936, which allowed him to shape the literature of the Third Reich to something in line with Hitler’s tastes. And in 1938 Bouhler seized from Lammers and Bormann control of a crucial sphere of influence that would allow him to shape national policy. Bouhler won the battle of Hitler’s mail. Adolf Hitler, like most national leaders, received lots of letters. Most of them were mundane stuff–requests for approving the dedication of a new bell or street or building in Hitler’s name, requests for clemency for Nazi SA men who’d gotten themselves in trouble with the law, requests from Jews for exemptions from discriminatory laws, and other miscellaneous requests for favors and jobs. Many of these letters were staffed out. Some Bouhler passed on to Hitler for personal review. One such letter came from the parent of a boy born blind, deformed, and brain damaged. The letter requested that Hitler allow the parents to perform euthanasia. Bouhler, who’d remembered one of Hitler’s favorite rants about the Spartan practice of killing handicapped infants to strengthen the whole, decided to pass the letter up to his master, and to begin formulating a policy that would empower doctors to murder other physically and mentally unsuitable children. Bouhler knew this policy would find favor with Hitler, who, when given policy options, always plumped for the most radical one available. Soon, the policy, which, because the office implementing it worked out of a building at Tiergartenstrasse 4, was codenamed Aktion T-4, expanded to include adults, who were “euthanized” in gas chambers at medical facilities around Germany. The techniques employed and the experience gained in using these methods were later transferred to the Nazis’ killing centers in Poland, where they scaled up for use against Jews, Gypsies and other racial groups the Nazis felt were equally unworthy of life. Bouhler’s star reached its zenith during his management of the euthanasia program, but the distractions of running this program–which officially shut down due to bad publicity in 1941, but secretly carried on afterwards–meant that, by degrees, Martin Bormann started carving off pieces of the Fuehrer chancellery’s powers. By 1944, Bormann was both Party Secretary and Hitler’s private secretary. In this role Bormann controlled all access to Hitler, freezing Bouhler, along with many other top Nazis, out. Such was the way power shifted in Hitler’s Reich. Bouhler and his wife were arrested by the U.S. after the war. Like several other leading Nazis, Bouhler committed suicide by cyanide capsule. So ended the life of a murderer whose chief weapons were office politics and postage stamps.